In the four years (!!) since I started this blog, I've gotten a lot of emails and questions about product recommendations, and more specifically, about natural replacements for certain types of products. With that in mind, I thought it would be fun to do a series of posts encompassing some common questions I've received, as well as some of the products I personally found most difficult to transition to natural and nontoxic options. Starting us off, let's talk about a product that doesn't get mentioned very much: medicated lip balm. What's so wrong with medicated lip balm? In addition to the regular nasties found in conventional lip balm - things like petroleum, silicones, parabens, and synthetic fragrance - medicated lip balms contain ingredients like phenol, an antibacterial and analgesic ingredient linked to neurotoxicity and respiratory, kidney, and cardiovascular problems, docosanol, a topical drug that's been linked to headaches and has not yet been tested for safety with pregnant and breastfeeding women, and chemical sunscreens, linked to free radical damage, cancer, and endocrine and hormone imbalances. And consider this - the labels on both ChapStick and Blistex Medicated Lip Balms include warnings to "Keep out of reach of children. If swallowed, get medical help or contact a Poison Control Center right away." Now, I'm sure they're referring to swallowing larger quantities than a couple swipes across your lips, but do you really want to be putting something with a poison control warning on your mouth?? I'll be totally honest: I've never used a conventional medicated lip balm. 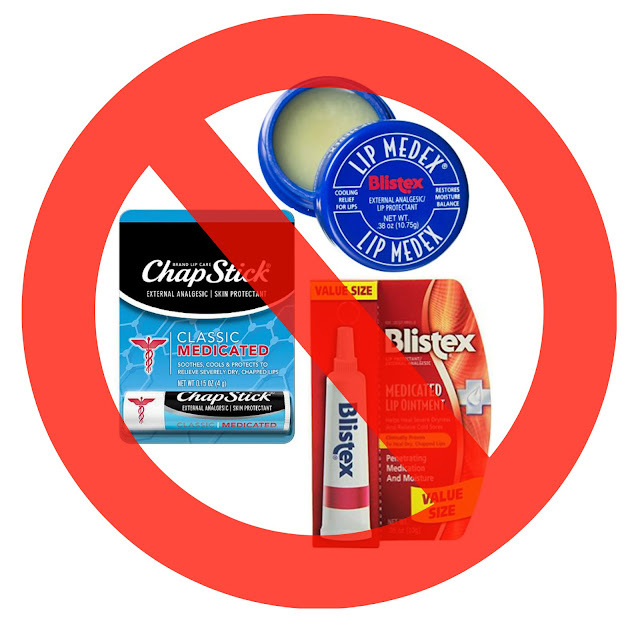 But, from what I've seen, people opt for these choices over regular lip balm for one of three basic reasons: i) to treat cold sores, ii) for sun protection (SPF), or iii) because they like the tingle and/or numbing sensation from phenol, menthol, eucalyptus, camphor, and/or mint. So, with that in mind, I've got replacement options to suit all three uses. I've tried most of them personally, but a couple I've included just based on ingredients and positive hearsay. I also want to mention that I came across more than one article on the habit-forming nature of ingredients like phenol in lip balm, so if you're making the switch, keep in mind that it may take some time to break your lips of that dependency. There's a ton of anecdotal evidence about treating cold sores with the amino acid lysine. Lysine won't cure the actual herpes virus behind the cold sore, but it's a popular holistic treatment for outbreaks and can both prevent the onset of a sore, if caught early enough, and speed up healing time of any sores that do erupt. (Along with applying it topically, lysine is great to take internally for cold sores too.) 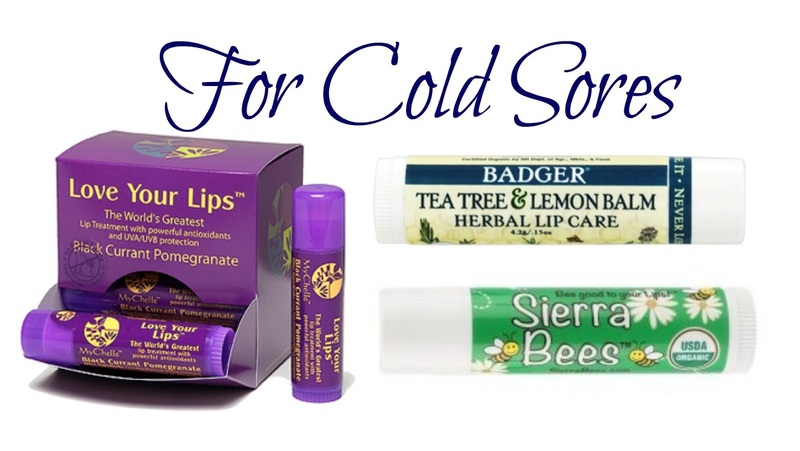 Other good ingredients to watch for when targeting cold sores are tamanu oil, melissa/lemon balm, and tea tree. I don't recommend the popular Quantum lysine lip balms due to their chemical sunscreen content, but MyChelle makes a great alternative. The Love Your Lips Lip Balms come in four flavors and are made with both lysine and lemon balm. They don't have any listed SPF content, but they do contain titanium dioxide, so there's a good chance you're getting at least minimal sun protection. Badger's new Tea Tree & Lemon Balm Herbal Lip Care is another great choice and certified organic as well. Along with tea tree and lemon balm, it also contains tamanu oil and peppermint oil and menthol crystals for a refreshing minty tingle. The Herbal Lip Care is available in both Badger's classic lip balm and cocoa butter lip balm formulas. Lastly, the Sierra Bees Organic Tamanu & Tea Tree Lip Balm is another good one, although bear in mind that this one does have a pretty strong tea tree oil taste. It also doesn't seem to be sold on its own right now, just in the Sierra Bees Variety Pack. As I said before, chemical sunscreens are not ingredients I favor, so these two picks both offer mineral-based sun protection. My top choice is the Hurraw! 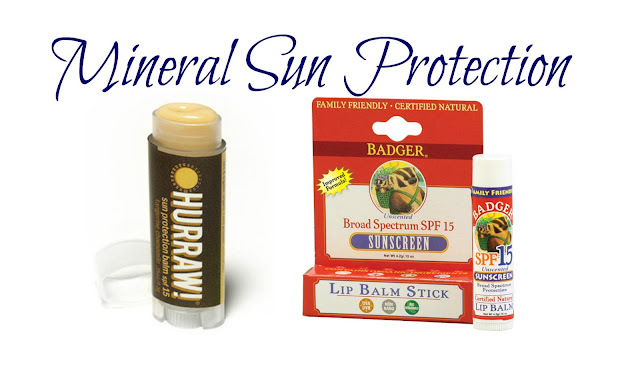 Sun Protection Balm with SPF 15, which smells great and is made with non-nano zinc oxide. It goes on clear, without any whitecast, and is also made with red raspberry seed, sea buckthorn, and pomegranate seed oils, which have SPF and antioxidant properties of their own. Badger is the first company I think of when it comes to safe sunscreen and their Sunscreen Lip Balm Stick (SPF 15), made with non-nano uncoated zinc oxide, is another good option. It's unscented and more longwearing than the Hurraw!, but it can leave a whitecast on your lips. For that reason, this is a great one for layering under a colored lip product. The Hurraw! Mint Lip Balm is not for the faint of heart! I finished my tube a while back, but I remember not wanting to venture outside in the winter with this on because of just how cold and minty it felt on my lips. For slightly less punch, but still a decent minty tingle, Portland Bee Balm's Oregon Mint Lip Balm is an excellent choice. With only four ingredients, the peppermint is noticeably tingly, but not as strong as in the Hurraw! On the more mild end of the spectrum, Epic Blend's Mint Hemp Lip Balm is fantastic. It gives just the slightest tingle, but moisturizes like a dream and has a wonderful fresh peppermint/spearmint scent that reminds me of chewing gum. Burt's Bees Soothing Lip Balm with Eucalyptus and Menthol also sounds promising, though I haven't used it myself to gauge how strong the cooling sensation actually is. And that's a wrap! Let me know if there are any particular kinds of products you'd like to see featured in upcoming posts for this series.